With advent season already having started, Christmas is high on everybody’s minds! Take a peek inside most homes, and you’ll find that there’s a lot of last minute activity going on – final touches on the tree, presents being wrapped, and stockings being hung. Even if we plan in advance, there always seems to be something to do at the last minute, doesn’t it? And even though we’re big into planners ourselves, you have to admit there’s a particular thrill in that last minute rush! Today’s craft is a simple, lovely craft that’s perfect for when you don’t have much time but still want to make something pretty. It’s a cute Cupcake Liner Tree Christmas Ornament, to add that little handmade touch to your Christmas decor this year. And here’s a disclaimer – these are pretty addictive; you can’t stop with one! 1. Start by choosing cupcake liners of your choice. We loved using a check-patterned green liner for this craft, but you can go with spots or stripes! 2. Fold each cupcake liner into half and again into a quarter. Try not to open the cupcake frills totally so that they stay a little fluffy, like a Christmas tree. 3. We need three cupcake liners for one tree. Fold two liners into quarters as described in the previous step. Stick them on the Popsicle stick, overlapping just a little and taking care to leave behind space at the bottom for the tree trunk and at the top for the third cupcake liner. 4. Apply tacky tape/tacky glue on both sides of the top of your Popsicle stick. Fix the third cupcake liner as shown. Use glue to seal the open flap of the liner. 5. Make as many liner trees as you like! Try out an assortment of patterns to make it more interesting. 6. 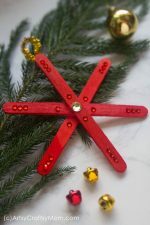 Stick your embellishment on the top of the tree and add a twine to hang them. It can be buttons, stars, stickers – anything that catches your fancy! Bet you didn’t think that it would be this easy! 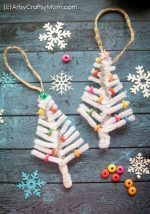 These are pretty easy for first or second graders to make, and it’s a great way to keep them busy while you get the rest of the preparations under way. We know this is a Cupcake Liner Tree Christmas Ornament, but you can also use them when wrapping gifts. Wrap your gift with plain, unpatterned paper and stick the tree on it, without the twine. 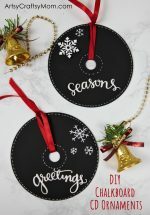 You can also stick them on plain card stock for a fun Christmas greeting card. Think outside the box – the possibilities are endless! Merry Christmas and merry crafting!